this was not on my shopping list this season, but it has been on my 'need list' for several years. i had pretty much given up on looking for well-made and comfortable black leather flats. intermittently, i'd check out the Christian Louboutin version (the cheekily named 'pigalle' flat), but the price put me off. 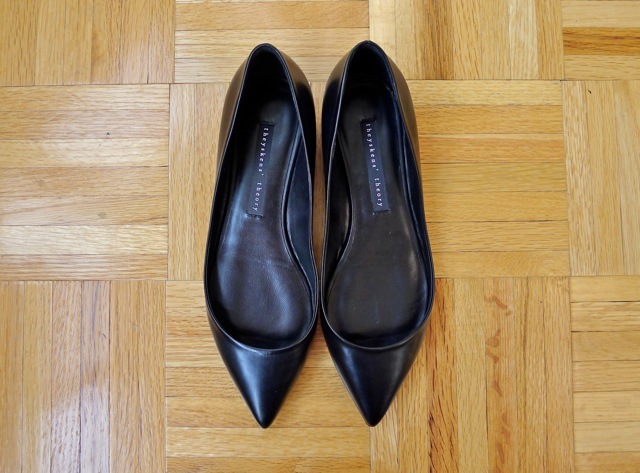 i was very happy when i found these black leather pointy-toe flats by theyskens' theory on sale the other day. perhaps finding just the right wardrobe foundation item is a bit like dating after all - you end up with exactly what you're looking for when you're not looking! they run a little short - so half sizes should size up by half (i'm usually 6.5, so the 37s fit me nicely). the shoes are beautifully made out of calfskin, and unlike a lot of other similar shoes in this style, don't feel flimsy. the lower vamp also shows a little toe cleavage - which i'm fine with. i really love that there's no embellishment or unnecessary crap on these shoes - too many other styles i've looked at have grommets, ribbons, studs, etc. that totally miss the point of what a classic black dress flat should look like. the soles are slim in keeping with the elegant silhouette, but since these are dressier-occasion shoes (and therefore not going to be worn nearly as much as, say, my boots), i think i'll just take them to my cobbler to get a thin vibram half sole put on for a bit more traction. i am a bit of a wimp when it comes to heels higher than 3 inches, so i'll be wearing these a ton for work events and evening when i want a more elegant shoe, but still want to remain comfortable and mobile. what's your version of the classic dress shoe? I don't have any real dress shoes! It's always been a bit of a headache finding the right flats that look dressy. I used to wear a pair of Ferregamo flats but honestly they aren't 100% me. It's a good thing dressy occasions don't come up too often for me. Pointy flats are an interesting preposition - I've never been fond of how they look on my wide feet. I saw a pretty display at a shop the other day with navy, red, and cream pairs. Would love to see how you style these! Oh dear, the words "dress shoe" make me want to run away (in my ankle boots and tennis sneakers) and hide! I've made some pointy-toed mistakes in the past, usually in the form of a kitten-heeled disaster, so I'd be interested to see how these look on you & get some ideas for myself. they are beautiful! if i got them, i would probably end up wearing them in a jiffy, even with a vibram sole. these are a great find! i love a shoe that reveals toe cleavage and has no embellishments (which i find hides a shoe's poor construction/quality). these shoes look really well made. after a hellish day trying to break into the patent black flat the other day I've become a bit more shy on buying shoes without trying them on, I guess I will go hunting for such shoes when I go to New York! would love to see how you style them! it goes with your wardrobe very well. anonymous: i know! and i know what you mean about heels - i actually try to avoid wearing them as much as possible. i hate the feeling of being at a nice event only to be thinking about uncomfortable shoes :P i'll do a style post on these soon! stephanie: hehe - don't even get me started on my platforms sins from high school! i've seen a few pairs of pointy-toed kitten heels that i like by pierre hardy, so i don't think all point kitten heels are bad. verdict so far after wearing these a bit in my house - very comfy! i.rene: thank you! :) i will probably want to wear them a lot more than too for everyday. the leather is lovely, so i'm going to try not to scuff them too much from the city sidewalks! S: i know - it's really annoying when something is embellished for the sake of decoration. quality women's shoe designers should take a hint from men's shoes - form should follow function! Eva: i agree! :) everyone needs a version of a flay dressy shoe in their closet, in my opinion. Nanashi: thanks! they're still available on theory's website, as well as some other stores. you should bookmark them and watch out for sale reductions. which pair are you breaking in? i've had a few pairs that had no breaking in period - those are the most valuable! They are really lovely! I don't have any dress shoes at all, not even pumps, except for some vintage Etienne Aigner wedges, they've worked out so far. I like the pointy toe and the toe cleavage, beautiful. Simple and chic. They seem like the perfect addition to your wardrobe. Perfect shoes from my point of view. If round-toe is perfect for every day then pointy-toe makes almost any shoe in a going out, smart shoe. Great buy! UGH. So glad someone understands my search. These are unfortunately out of my price range at the moment, but I've run my MIA "Hepburn" flats into the ground and the don't make them anymore. Really enjoying your blog, I am also all about the basics. just wanted to drop by and thank you for posting about these shoes. i have a "dress up" job and, although i do enjoy heels from time to time, i've been searching for a modern, elegant flat like this for years. with patience, i managed to find a pair via gilt on black friday and they arrived today! still an investment but totally worth the wait! love 'em. best of all, they look as good with skirts and dresses as they do with skinny jeans. @erin thanks for stopping by and commenting! so happy that you finally found your perfect flats :) i love sharing great finds with my readers. are yours theyskens theory?